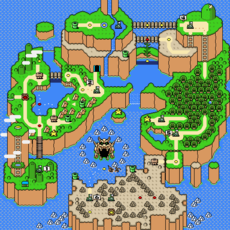 The Forest of Illusion is the fifth world of Dinosaur Land in the game Super Mario World. 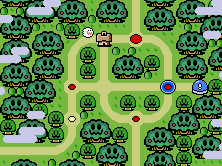 The forest contains one fortress, one Ghost House, one Star Road, the Blue Switch Palace, and many secret paths. The world can be challenging, since beating the regular exits will only take the player in a circle, hence the name. To find the way out of the forest, the player needs to find the secret exit in one level. Forest Secret Area, #5 Roy's Castle, and Forest Fortress are the only levels without multiple exits. When any level is beaten, in addition to a path appearing, trees will disappear. It is part of the same landmass as Cookie Mountain. Levels that are marked with an asterisk (*) feature a secret exit. The Forest of Illusion was featured in several episodes of the Super Mario World animated series, though here it was renamed the Enchanted Forest and had a much more sinister appearance, being darker and with more horrific faces on the forest's trees and bushes. The Enchanted Forest first appeared in the episode "Ghosts 'R' Us" where it is the main setting of the episode and was revealed to be owned by Wizenheimer; what could also be the Enchanted Forest was also in the episodes "King Scoopa Koopa" and "Mama Luigi". The Japanese name for the Forest of Illusion is the same as that of the Lost Woods, a recurring location within The Legend of Zelda series; the concepts of both areas are also the same, involving the player getting lost. ↑ Official Super Mario World iQue website. iQue. Retrieved May 30, 2018. This page was last edited on November 19, 2018, at 17:06.